A true hunter needs to use different types of appliances to be an advanced hunter. He also should have good command over the advantages and limitations of his accessories. One of the most important appliances for a bow hunter is a broadhead. Our today’s article on the best broadheads review makes you understand all the important factors of broadheads. A broadhead is a cutting device attached to the front of the arrow shaft. Today we decided to dedicate our article into finding the right broadheads. Animals deserve respect and humanity. Hence, should be the hunt in a humane way, not mercilessly wounded. To hunt an animal in a righteous way, a proper broadhead is a must. So before buying any broadheads, you should read our article about the best broadheads for a crossbow. To choose the right broadhead, some hunting factors should take into consideration like -the velocity, the extraction, the speed of the arrow and most importantly the efficiency of the hunter. A good broadhead must cut efficiently, minimize flight deviation and should be stable on impact. The choice of broadhead also depends on the skill level of the hunter. Every broadhead is not of the same kind. They come with different strengths and weaknesses. Some are specially made for the beginners while some others are appropriate for the pro hunters. Some come with the replacement while some others with durable construction and require expertness in using broadheads. However, here in this article broadheads review, we have accumulated some broadheads from different types and manufacturer. In this article, we mainly counted the quality and efficiency of the products. Hope, this article will help you to know the overall benefits of different broadheads so that you can choose the correct one as per your requirements. 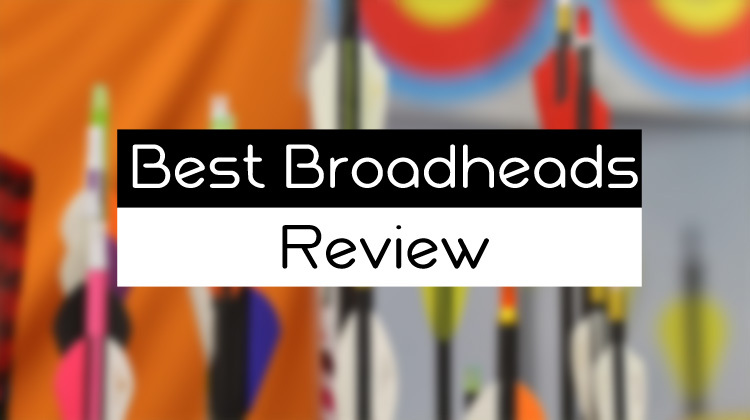 In this section, we reviewed 10 of the broadheads for you. What are those? Let’s see the list of the top broadheads in 2019! 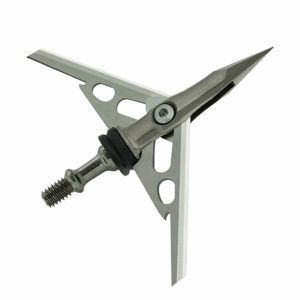 G5 Outdoors Montec Crossbow Broadhead is a fixed tip broadhead. This broadhead is made of 100% stainless steel. This lightweight broadhead tip shows the power of a fixed tip very well. This lightweight feature makes it easy to carry for hunting adventure. Though it is very lightweight broadhead, it lends sufficient wind resistance. As a result, you can get a true and accurate flight. The spin of this broadhead is well balanced and weight is just perfect for a true flight pattern. This broadhead also includes diamond cut blades. These blades are very sharp and that’s why go right through the game if shot perfectly. This head type will also help you to work more on accuracy so that you can hit the target accurately. So that it may cause more damage and a bigger blood trail. If you purchase these heads, you will find a few practice blades which will give you a better feel about the head before going out on a hunting adventure. These blades are developed using MIM( metal injection molding) technology. This is one kind of heat treatment which increases strength and density. Due to this, the blades get stronger and more aerodynamic. As there are no parts to put together or replace, you can start shooting just after screwing into the shaft. Being a fixed blade broadhead, it is made to last for a long time. As these broadheads include all the latest technology, you will have to spend a little more to get one. But they are absolutely worthy of your money as they don’t require frequent sharpening or fixing. So, your repairing cost reduces and thus they save your money too. These tips are highly recommendable if you want to get the pure taste of hunting. They are among the best broadheads for deer hunting. Next, the Broadheads to make it to our list of the Swhacker Broadheads, and you’ll see why! Swhacker 100 Grain 3- set belongs to the best mechanical broadhead for a crossbow. It is made of high- carbon steel whereas the expandable blades are made of stainless steel. This amazing broadhead flies like a field trip. It’s two separate cutting edges makes it different and unique. It’s a bright green colored pole is made from bronzed aircraft aluminum. These features make this arrow tip one of the most durable broadheads. This mechanical broadhead is able to hit through 2 inches after penetration. The Swhacker offer the biggest cutting diameter. This large cutting size ultimately makes the perfect wound channel. The more internal organs get in touch with the sharp blades, the more the blood trail becomes. And this leads to the faster kill. The sharper blades and wider cutting diameter make these devastating weapon a good option for deer hunting. This mechanical broadhead is ideal for beginners and advanced hunters. This broadhead is also an ideal option for target practice as the main tip takes all the impact upon it and hence it gets preserved. So, you can practice for a longer time. Again, it doesn’t need frequent sharpening. These broadheads come at an affordable price and that’s why, if you are a beginner hunter you can choose this one without any tension. If you have a Wasp Drone, you won’t have to compromise anymore while hunting. It is a fixed blade mechanical broadhead. The solid steel ferrule of this broadhead helps to reduce surface area so that you can get excellent result in strength, accuracy and easy arrow removal. The edges of Wasp’s exclusive Stainless Smart Tip (SST) combine with each blade and by creating ways for the blades results in easier penetration. It is not held together by tiny screws or pin, rather than pressed onto the ferrule. So. It’s strong enough and won’t come off out of adjustment. This makes this tip one of the smartest tips. In this broadhead tip, solid steel has been used. This solid steel has so many advantages. It not only increases the strength but also reduces the surface area. And when the surface area is reduced, broadhead’s flight automatically improves. Wasp has brought their first replaceable blade in the market. Since then, it is being developed. Their blades are hard enough to get a razor sharp edge which is flexible yet not brittle. As a result, they bend but don’t break when crash through bones. Though all of the Wasp Drone fly excellent when shot from a well-tuned bow, it’s the compact size and reduced surface area have made it extraordinary. Because of this, if any tuning issue arises, yet you will be able to hit properly where you are aiming. This crossbow head comes in a 3 pack, including 2 sets of replacement blades. After shooting with this excellent broadhead, certainly, you will be a great fan of it. G5 Montec Cs is a part of a wider range of G5 which includes stainless steel Montec, the Montec Preseason and the Pink Montec. This G5 Montec Cs is a revolutionary crossbow broadhead that combines the original tough one-piece construction with 100% carbon steel. Carbon steel retains the sharpness of the edges for longer than the stainless steel Montec. So, now it is a complete package of solid construction and sharpened edges. This is a fixed blade broadhead where blades are 3 in number. The Montec Cs is available in 100 grains. It’s cut on contact design and diamond sharpness ensures easier penetration. This superb broadhead is very simple to use. There are no moving pieces hence doesn’t require assembling. The head simply screws on and ready to shoot. It’s wider cutting diameter results in severe damage and bigger blood trail. The Montec Cs comes with a different shape due to the fact that the heads are made by using an injection molding process. Because of using this process, the heads are made exactly the same and it’s one piece construction is achieved. It’s including carbon steel has both advantages and disadvantages. Using a head made of carbon steel makes the sharpening of the blades easier. And the disadvantage is that unprotected carbon steel is prone to get damaged too quickly when it is left exposed to air and moisture. Now, it’s obvious why G5 Montec Cs is so popular. These broadheads fly like field points, hit hard and penetrate everything that comes in their way. Our 5th item is Muzzy Mx3. Which is from Muzzy Mx series is an excellent addition in the world of crossbow broadheads. It is the most popular manufacturer of fixed blade broadhead. This Muzzy Mx-3 crossbow head includes the original Muzzy design with some extra advantages. This one works perfectly well with most of the crossbows. The Muzzy Mx-3 flies faster than most other heads. This crossbow head provides long range accuracy than others of Mx series. It provides accuracy for most of the whitetail hunters who usually take shots of 30-35 yards or less. This crossbow head comes with very durable construction. It includes nice fitting and finishing and solid blade lock up. It has been made to perform for a considerably longer period. This arrow head’s easy to use feature increased its popularity. The assembling process is very simple. The manufacturer also supplies a broadhead wrench to assemble and disassemble. The Muzzy Mx 3 has been made from high-quality steel. It is shorter profiled and lightweight, yet Improves the flight excellently and increases the distance you get from shots. It’s standard 3 blade ensures larger wound channels and bigger blood trail. It also does the penetration well. 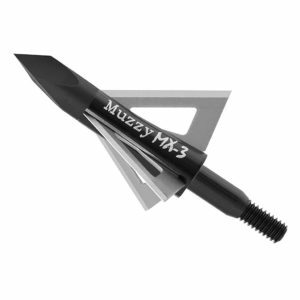 Muzzy Mx-3 fixed blade broadhead comes at a very reasonable price. But, they add an extra advantage here for the users which increased the popularity of the product. They provide a broadhead wrench and a blade case with it. Overall, it can be said that Muzzy is popular among the casual bow hunters for plenty of reasons. Rage Hypodermic is one of the most popular broadheads. It’s a simple design, easy to use formula and tough construction made it one of the most selling broadheads. To meet the growing need for crossbow heads across the nation, Rage has introduced two new Hypodermic broadheads, which are Rage Hypodermic 100 grain and 125 grain. Rage Hypodermic broadhead is designed especially for the crossbow archers with same surgically sharp, .035 inches stainless steel blades and 2 inches cutting diameter. Hypodermic is known for durability, great penetration, razor-sharp blades, and wider cutting diameter. Wider cutting diameter ensures destructive wound channels and massive blood loss. These ultimately lead to a good and humane kill of the animal. This new Hypodermic broadhead includes the popular Hybrid tip which is sharp as a needle. It helps to achieve accuracy like a leading edge blade. It also helps to improve bone crushing performance. This tip also helps to derive maximum penetration. Advanced Shock Collar technology helps to keep the blades in place. That’s why kinetic energy is achieved at it’s best. Ultimately, a large wound channel and better blood trail are provided. Because of this high energy shock collar, this broadhead can match the diameter of most crossbow bolts. Aerodynamic steel ferrule is very helpful. It strengthens the tip to a great extent. As a result, the tip remains safe from wearing and tearing down. It also helps to get maximum penetration. The manufacturer also provides a free practice head, so that you can step out for your next hunting immediately. The Muzzy Trocar crossbow broadhead belongs to the group of fixed blade which combines original Muzzy Mx-3 with an added feature of new helix facelift design to the body structure. Muzzy Trocar comes in both 100 and 125 grains. It’s included blades are made of stainless steel and designed in a helix pattern. Because of this pattern flight becomes more improved and also overall performance. As the blade designed open, it doesn’t affect the flight. Accuracy is one of the most important concerns with any broadhead. But, if you have a Muzzy Trocar, you can remain cool. You will be surprised to see it’s accuracy. It works excellent even at a distance of 50 yards. Unlike many fixed blade broadheads, Muzzy Trocar doesn’t need the flight path to be tuned to ensure accuracy. It’s accuracy just amazes the users. Another important feature of this crossbow head is its solid steel ferrule. Solid steel ferrule ensures that it won’t get damaged if it strikes bone or something like that. It’s sharp steel blades and solid ferrule makes it an excellent choice for beginner hunters as well as passionate. The Muzzy Trocar is weather resistant and can withstand shot abuse. Muzzy brand is providing broadheads for quite a long time. 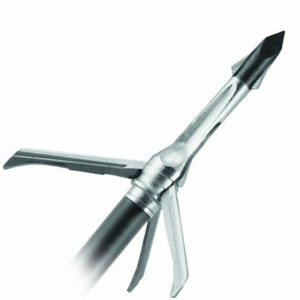 This Trocar broadheads is durable enough and can perform for a considerably longer period with proper take care. It doesn’t require frequent sharpening. Because of its solid steel ferrule and razor-sharp blades ensures a wider cutting diameter. The toughened steel tip helps to achieve great penetration. This crossbow head comes in the pack of 3. Another great advantage of this broadhead is replacement blades are also available. You can buy these blades in the pack of 9 and they are very easy to install. 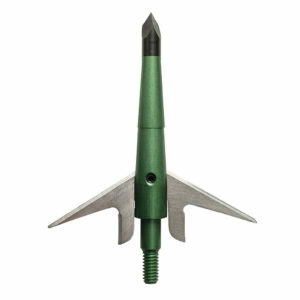 Rage 2 blade mechanical broadhead is one of the popular broadheads. It is popular among the intermediate archers. If you have a well-tuned crossbow and you don’t take much longer shots, this broadhead can be the best option for you. stable flight. It includes tough and sharp blades which are made of stainless steel. These blades are fixed positioned but movable and open in contact. As these blades open in contact, the chances of arrow deflection and energy loss get reduced considerably. Generally, mechanical broadheads tend to lose power quickly upon impact. But, with the Slip-cam Rear Blade Deployment System, it’s no problem. The modernized smooth profile of this crossbow head provides faultless accuracy and arrow speed like a field tip and full deadly force of a fixed blade broadhead. That means, if you own this broadhead, it will serve both the purpose. The broadhead also includes ShockLock system that helps to hold the blades firmly in place. There is no need for any rubber bands to hold blades in place. It’s designed in a simple way so there is very little chance to go wrong with it mechanically. It can provide great penetration if you can handle it properly. If your bow is not enough power or not tuned properly, it may not provide desired penetration. Again, for long shots, it’s not a good option. But, if you handle it cautiously, it can be a great crossbow head for you. In short, faster bows, heavier arrow, reasonable distance, and well-tuned bow can ensure better penetration. 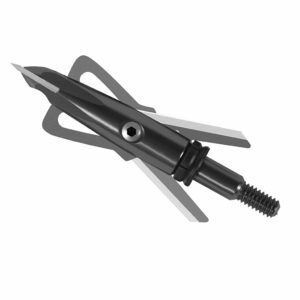 The broadhead features 2″ cutting diameter and also open wider upon impact. Because of this huge cutting diameter, deadly wound channels and larger blood trails are achieved. As a result, hunting becomes more perfect. 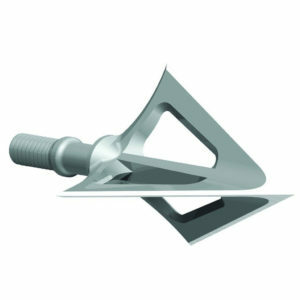 Carbon Express XT Dual Blade is one of the effective broadheads an archer looking for. This broadhead is a precise one with high performance. Like other Carbon Express broadheads, this one also promises to allow you to “shoot better”. Its body is made of aircraft grade aluminium ferrule and the including blades are made of stainless steel. This broadhead provides maximum damage, accuracy like a field point and works well with both carbon and aluminium cross bolts. From razor-sharp blades to maximum spin test, Carbon Express broadheads assure impressive accuracy. This includes dual side by side cutting blades and six razor-sharp cutting edges that help to create up to 250% greater wound opening than conventional crossbow heads. This leads to significantly greater wound, better blood trail, and a faster kill. 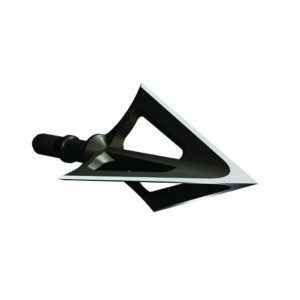 Every aspect a hunter needs are fulfilled by this single broadhead. Its aerodynamic profile protects the broadhead tip from wearing down. Again, 100% spin testing assures deadly accuracy. It’s serrated blades maintain sharpness to assure maximum damage. Grim Reaper Razor Tip is the original razor tip broadhead. 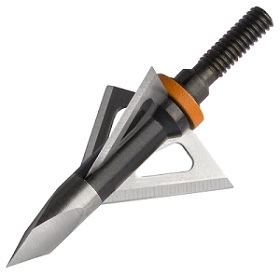 Though this broadhead is lesser known, it performs excellently. 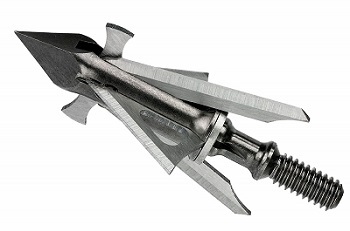 This mechanical broadhead tip solved all the problems associated with mechanical broadheads. When you have a Grim Reaper, you don’t have to worry about arrow deflection. You can take steep angled tree stands shots, uphill shots, downhill shots and many more. You can shoot through plywood, steel drums, big buffalo or Bear and anything else of your choice. Grim Reaper Razor Tip flies like a field trip. Hence, it doesn’t require tuning the bow repeatedly. The blade design and arrangement of this head also improve penetration. The thin blades have less surface area and less surface means less drag and consequently great penetration. The swept back blade angle after deployment ensures easier penetration. As the Grim Reaper pass through the shots very well, they leave impressive wound channels and consequently better blood trail. The Grim Reaper razor tip design doesn’t require any additional rubber bands to hold the blades in place. The design is based upon a tension spring system that ensures that the blades are securely restrained until impact. As the tension spring system holds the blades firmly, broadhead in the quiver remains fixed and rattle free. If the arrow bumps normally, it doesn’t make noise. The blades open very easily with rearward force but normal bumps have no effect on the broadhead. That’s why hunting becomes more perfect and enjoyable. Replaceable blades are available at a very cheap rate. And the replacement process is very easy. Most Noteworthy all the broadheads are not the same features and quality. They vary from each other in terms of strength and benefits. If you buy a broadhead randomly without proper research, you may end up buying low-quality one and your money gets wasted. That’s why you need to choose carefully taking some factors in the account so that you can get one that serves your purpose excellently. Mechanics broadheads are the most durable and excellent quality broadheads. They are also referred to as expandable broadheads because they create the best blood trails while hunting. The expansion from this type of broadhead results in faster kills. Though these broadheads are expensive, they are worthy enough to buy. While buying one of this type, keep in mind that these are compatible with that type of bows which needs more kinetic energy. These broadheads are best in use with traditional bows. As the name suggests, the blades are fixed and cannot be moved. 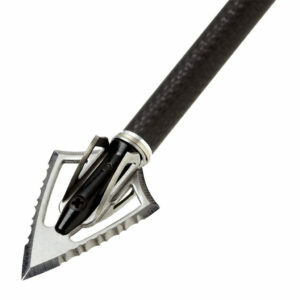 Again, fixed blade broadheads are of two types. One is Replaceable and another is one piece broadhead. Replaceable types of broadheads are popular and comfortable for the beginner hunters. When the blade loses its edge it is just replaced to avoid the cumbersome process of sharpening. However, 2,3 &4 blade configurations are available in the market. They are popular because of their versatility. They allow replacing the blade whenever it gets damaged. For the beginners, the more possible number of blades are helpful. If the blades are more in number, they help to increase the wind resistance causing a dive. One piece fixed blade broadheads are of excellent quality and appropriate for the expert hunters. This type of broadhead has a sharper tip that goes through the hide fast. Then the blade cuts and loss of energy is reduced and penetration increased. These strongest broadheads are the first choice of any passionate bow hunter. The material is another important feature to consider while buying a Crossbow head as it determines how long it will serve and how sharp a blade can get. Usually, Crossbow heads are made of two materials. Stainless steel and aluminum. But, some broadheads also come with a combination of both. Some of the broadheads are made of carbon steel. Though they are the sharpest head, they have some disadvantages also. Carbon steel is prone to get damaged easily. As your hunting skill mostly depends on your crossbow head, you shouldn’t buy one which easily bends or break down. This will lead you to replace the head continuously and the cost will increase. On top of that, your target also is affected as the blade won’t do enough damage. The distance one gets from a shot largely depends on the weight of the Crossbow head. It also determines the damage and blood trails. If the broadhead is lightweight, you may get the best range, but it will make a small wound channel and less blood trail. As a result, you might not be able to hunt in a proper way. On the other hand, if your broadhead is of heavyweight, it will need the most kinetic energy as the distance will be reduced. But as they are large enough, they leave severe damage and blood trails. So, you get to derive the proper taste of hunting. Size is also an important factor to keep in mind while choosing a broadhead. It determines how much force is needed for a powerful impact. A small and compact broadhead works best with low-speed bows. They also can produce maximum energy for deep penetration into targets. Big blades are heavy and hence need more durable crossbows to create more damage. Size also plays an important role in a game hunt. When one needs to shoot through a mesh, small diameter broadheads bring better result. The number of blades the broadhead has also mattered as it makes a difference on the aerodynamics of the broadhead. Different crossbow heads come with different numbers of blades. Mechanical heads have fewer blades than the fixed ones. In a game hunt, the number of blades is important as more blades help to leave more blood trail and more wounds channel. Price is an important factor while buying a crossbow head. In some cases, it becomes a decisive factor. Most often, price determines the quality of the broadhead. But, here are some excellent broadheads also which come with a comparatively low rate. If you compare different manufacturers product, you may get your desired product at an affordable price. Whenever you are sharpening your broadhead, make sure that it is placed properly, the tip or sharp edge is not pointing towards your body. When you need to tighten your broadhead, use a wrench designed for this particular task so that your sharp blades don’t get harmed. If you don’t use a wrench, you may end up injuring yourself. While carrying your broadhead for hunting, ensure that it is covered properly. Because sharp edges may cause injury if they are visible while carrying. Carefully accumulate every part of the broadhead after every kill. Even when you are dressing an animal, make sure that every part is found, because all the components inside the animal can cause serious injury if you don’t take precaution. For mechanical broadheads, fixing the blades require extra attention. Carefully tighten them before going out for hunting. If you notice any screw is loose, immediately fix it and ensure that they are placed properly. Now that you have a better understanding about the features that make a broadhead unique and different from others, you should be able to get into this selection with better knowledge and information about the best crossbow broadhead. Q: What type of broadhead will be appropriate for my bow? Ans: If you are using a conventional broadhead, you will have to care about its weight. A bow with proper weight will be ideal for you. You should select such a bow that employs heavy draws to make up for the low velocity and to expand the impact force as well. Compound bows are compatible with light draw weight bows. Cut on contact broadheads with 2 or 3 blades may be an ideal choice. But keep in mind that, the heads work with Crossbows with a draw weight of around 30 to 50 pounds. Q: What is the Kinetic Energy? Ans: The Kinetic Energy of a broadhead or an arrow means the power it grasps while moving. The high Kinetic energy of a broadhead ensures better penetration. To hunt properly, this criterion is very much needed, especially at the ranges that exceed 20 yards. Q: What type of broadheads is the best? Should I use 3 blades or 4 blade broadhead? Ans: You can choose as per your preference. Both come with different advantages and disadvantages. 3 blade broadheads are likely to get unsteady but they give the best distances. And the 4 blade broadhead have better balance and they are ideal for real flight track. The large blades of 3 blade broadhead create large entry wounds but for best damage, 4 blades broadhead is the best option. They leave the best blood trail. Actually, the performance of any broadhead depends on how well you can treat them. Q: What type of broadheads is the best for angled shots? Ans: If you want to shoot from a different angle, then mechanical broadheads would be apt for you. They are best for shooting from various angles. In these broadheads, there is no control on the point of impacts. This certain feature makes mechanical broadheads more popular. This is the end of our broadhead reviews. All the broadheads may some common features, but every single head has some unique features. Whether it is your very first crossbow head or addition with existing ones, if you have read the article carefully, you should get something according to your own requirements. As we have enlisted different types of broadheads, here there must be something for every individual.